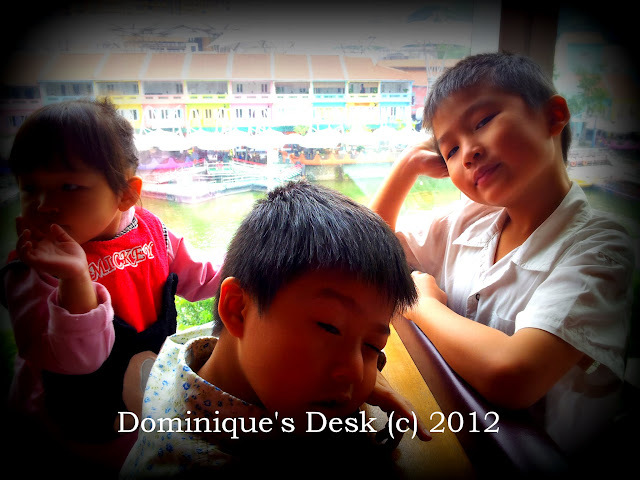 A few weeks ago we brought the kids to a Japanese restaurant at CENTRAL. They had to wait quite a while for the food to be served so I took out the camera and tried to capture some shots of them. As you can see the kids weren’t very cooperative posing for the camera that day. I decided on candid shots instead to capture their natural expressions. The boys having fun running around after lunch. Little sister siting on Monkey boy posing for the camera while he focuses on something else instead. Have you been able to capture any pictures of your kids lately? It’s hard to get young kids to pose for the camera…. but you did great! Lovely shots of them, Dom…very spontaneous too! I like the candid action shots too! The last pic is my favorite though, gorgeous!! my kids are complete hams! they will pose — fiercely!! any candid shots would just be a complete blur, since they never sit still. but yours – both beautiful! awww. your kids are adorable!! Awww. Your kids are adorable. I love taking candid shots, too. Their natural expressions are just priceless. Love all the pictures, thanks for sharing! I ♥ candid photos. Candid shots of my family are all I use in my home because it shows their personality. Your kids are so cute! Gee, your kids sure are cute! Random shots of kids are sometimes even better than those which are posed. It captures the essence of the moment. Great pictures! Looks like a fun time!